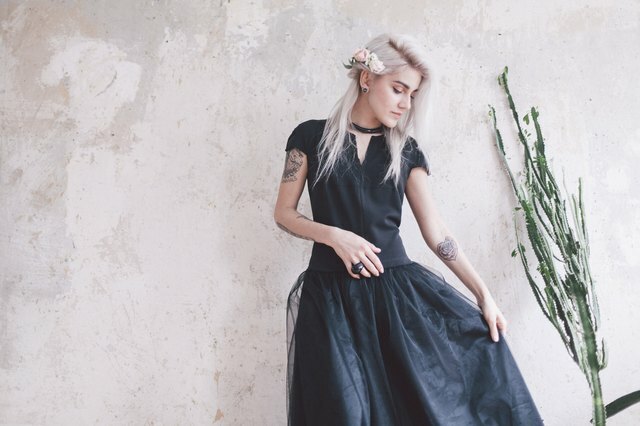 Silver hair hasn't always been on trend. In fact, in the past, it may have been quickly dyed a different shade to conceal the natural aging process. Nowadays, however, silver hair has become a fashion statement in its own right. From romantic to edgy, there's a silver style to suit anyone who, regardless of age, has a desire to step outside the status quo. If you're thinking about adding silver highlights to your hair at home, be aware that it's a multistep process that takes time to perfect as you work to get the right shade without damaging your hair. Unless your hair is a level 10, the lightest shade of blonde, you'll have to bleach your hair first before applying silver highlights. This process involves stripping your hair of its natural color, which can leave it brittle and damaged. You may need to repeat the lightening process several times over the course of weeks or months to get to the right level. Keep in mind, it's not wise to go from a level 2 (dark brown) to level 10. Not only will you wreak havoc on your tresses, but you also may wind up with a shade of orange. All hair contains some level of red and needs to go through multiple levels to get from red to orange to, eventually, the lightest shade of yellow. If you're unsure how to bleach your hair, research the process thoroughly first or have it professionally bleached. Once you've bought your bleaching kit of choice, either from a drugstore or a beauty product supplier, follow the directions on the box to mix the bleaching kit with gloved hands. Section off your hair into four parts. Starting in the back of your head, use a rattail comb to separate out a section of hair about 1/2 inch to 1 inch thick. Place a foil strip beneath it, and use an applicator brush to coat the hair completely with bleach, starting 1/2 inch from the scalp and working your way to the ends. Fold the strip in half twice to secure it to your head, and then work your way around your head and finally to the top, leaving 2 to 3 inches between strands. Cover with saran wrap or a shower cap and leave on for up to 45 minutes, depending on how dark your hair is. Be sure to check it often to avoid over-processing. Once your hair is a pale yellow, gently remove all foils, shampoo with a purple shampoo, towel-dry and comb your hair. Next comes a purple toner, which will remove any yellow undertones left by the bleach. Follow the directions on the box to mix the toner in a plastic bottle with 20 volume developer, a standard volume used in salons that gives equal lift and equal deposit of color. Apply to the bleached strands of hair and cover it again with saran wrap or a shower cap, then let it sit for 20 to 30 minutes. Again, check it often to ensure you reach the correct level of toning. 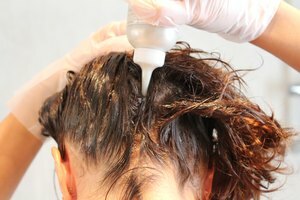 Once you've achieved your desired color, rinse your hair. Finally, apply the silver color, which also will look purple when applied. Let it sit for roughly another 30 minutes (checking it often), then rinse, condition and rinse again. For ongoing care, apply a deep conditioning mask at least weekly to continue adding moisture to your hair. Karen Spaeder is a versatile writer and editor with experience in print and online publications, SEO articles, social media, marketing communications and copywriting. Currently, she is the communications VP for a social media software company, where she creates social media and blog content, email campaigns, case studies and newsletters. Outside of her editorial experience, Karen is a yoga instructor and a health coach certified with the Institute for Integrative Nutrition. As such, she has expertise in health, wellness, fitness and nutrition.